We hear a lot of voices every day, don’t we? We hear the voices of mom or dad, spouse, kids, bosses, co-workers, teachers, announcers, and also the voice on the embedded video clip on that web page we have open that we can’t find and we can’t turn it off. Right? Well, think of this: Every Sunday, for some two thousand years, somewhere, somehow, the voice of Jesus is heard, over and over, Sunday after Sunday, coming from the mouths of His pastors. In many places and many times, for two thousand years somewhere people have gathered to hear the voice of Jesus in His Word. On this Palm Sunday, this Sunday of the Passion, from Luke’s Passion account, we want to hear the voice of Jesus rising above the surrounding noise—the noise of this world and the noise in our own soul—for in hearing Him, we receive life and forgiveness. 11. The crowd before Pilate, many of whom were singing praises for Jesus as He entered Jerusalem on this day: “Take Him away! Crucify Him!” And we know their voices prevailed. We’re talking about a lot of voices here. One of the thieves, who heard it all, is moved to turn to Jesus and say, “Jesus, remember me when you come into your kingdom.” Then, rising above the noise of all the competing voices, the voice of Jesus is heard, assuring him, “Truly, I say to you, today you will be with me in paradise” (Lk 23:42–43). In the same way, we hear the voice of Jesus rising above all the noise and racket and hubbub that is going on out there, and we hear His voice above all the noise in our own souls. 1. Jesus, in the upper room, washing feet and saying to the disciples: “I am among you as the one who serves,” for you! 3. Jesus: “The Scripture must be fulfilled in me, ‘he was numbered among the transgressors,’ ” for you. 4. Jesus praying to the Father in the Garden of Gethsemane: “Not my will, but your will be done,” all so that we can pray with confidence, “Thy will be done,” knowing that in Jesus God’s will for us is always good. 5. Jesus said to those who came to arrest Him: “This is your hour, and the power of darkness.” He went into the darkness for you. 6. Jesus said to Peter at the high priest’s house: Not words this time, just a look, one wordless look at Peter and Peter weeps bitterly. 8. Jesus, in front of the crowd who are screaming, begging for His crucifixion: silence (This time). He offers no defense, and their voices prevail, for Jesus is given over to death, for us, in our place. 10. Jesus, over and over: “Father, forgive them.” For that is what he had come to do, bring forgiveness of sins for you! 12. Jesus, finally: “Father, into your hands I commit my spirit.” So, He begins and ends with the Father, because the mission to take away your sins, my sins, is now complete, and full and free forgiveness is won, for you and me. 1. He does not explain suffering, but He overcomes suffering by suffering for us. 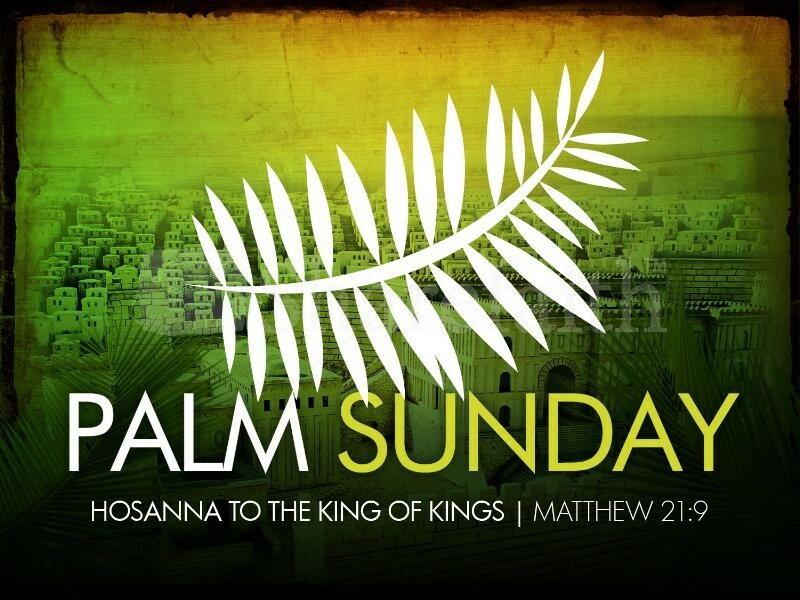 So, once again, we have gathered here on Palm Sunday, the Sunday of the Passion, in the year of our Lord 2019. We have come again, as He commanded us, to hear the voice of Jesus once more, “This is my body, for you.” “This is my blood, shed for you.” Hear that voice and believe. The life He gives, He gives for you. Adapted from Material in Concordia Pulpit Resources, Vol. 29, Part 2.